FRONTLINE PET CARE products feature a new formula to make sure that being healthy feels good. Enriched with Rhamnose to cleanse, calm and protect from bacteria and Luminescine, which has an antioxidant action that provides added shine and UV protection, these skin and coat care products are a simple and effective way to look after your cat or dog – and keep them looking good. Scientiï¬ÂÂÂÂÂÂc expertise meets affordability through the FRONTLINE brand you know and trust. Developed by veterinary experts to enhance and protect the coat of dogs and cats with dark-coloured hair. It contains phytopigments and Luminescine, a natural plant extract that helps deflect harmful UV rays and enhances colour and radiance for a brilliant natural shine. Rhamnose, a polysaccharide compound that inhibits bacterial adhesion to the skin and coat, reduces odours and has a soothing effect. Developed by veterinary experts to enhance and protect the coat of dogs and cats with white or light-coloured hair. It contains provitamin B5 for long-lasting hydration and Luminescine, a natural plant extract that helps deflect harmful UV rays and enhances colour and radiance for a brilliantnatural shine. Rhamnose, a polysaccharide compound that inhibits bacterial adhesion to the skin and coat, reduces odours and has a soothing effect. as well as detangling agents for slick, snag-free combing. Luminescine, a natural plant extract, helps deflect harmful UV rays and enhances colour and radiance for a brilliant natural shine, while Rhamnose, a polysaccharide compound that inhibits bacterial adhesion to the skin and coat, reduces odours and has a soothing effect. A gentle and protective formulation for puppies and kittens over two months of age, developed by veterinary experts. It contains Inca inchi oil, rich in omega fatty acids, in a soothing and moisturising formula for smooth skin and a soft coat. Luminescine, a natural plant extract, helps deflect harmful UV rays and enhances colour and radiance for a brilliant natural shine, while Rhamnose, a polysaccharide compound that inhibits bacterial adhesion to the skin and coat, reduces odours and has a soothing effect. Developed by veterinary experts for dogs and cats with sensitive, dry or irritated skin. Rhamnose, a polysaccharide compound that inhibits bacterial adhesion to the skin and coat, reduces odours and has a soothing effect, while Luminescine, a natural plant extract, helps deflect harmful UV rays and enhances colour and radiance for a brilliant natural shine. 1. Put your pet at ease by calmly stroking them. Ensure the water temperature is comfortable. Apply shampoo on wet hair. Lather for 5–8 minutes. Rinse well. 2. Have several towels ready to replace each one as it becomes wet. Place the towel on your pet’s back and gently rub the coat dry. Then move to the stomach, chest and paws. 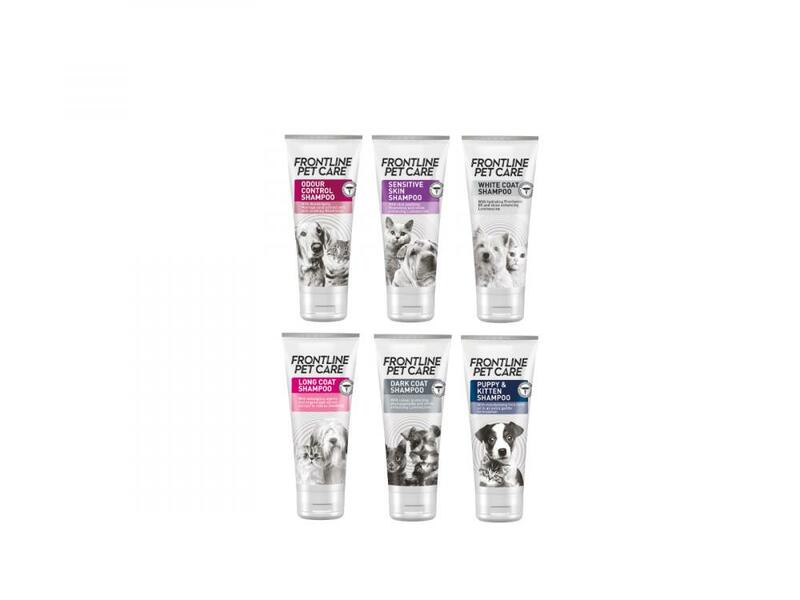 There are currently no questions for Frontline Petcare Shampoo - be the first to ask one!